For the television series, see Join or Die with Craig Ferguson. JOIN, or DIE. is a political cartoon attributed to Benjamin Franklin. The original publication by the Gazette on May 9, 1754, is the earliest known pictorial representation of colonial union produced by a British colonist in America. It is a woodcut showing a snake cut into eighths, with each segment labeled with the initials of one of the American colonies or regions. New England was represented as one segment, rather than the four colonies it was at that time. Delaware was not listed separately as it was part of Pennsylvania. Georgia, however, was omitted completely. Thus, it has eight segments of a snake rather than the traditional 13 colonies. The two northernmost British American colonies at the time, Nova Scotia and Newfoundland, were not represented, nor were any British Caribbean possessions. The cartoon appeared along with Franklin's editorial about the "disunited state" of the colonies, and helped make his point about the importance of colonial unity. It became a symbol of colonial freedom during the American Revolutionary War. Franklin's political cartoon took on a different meaning during the lead up to the American Revolution, especially around 1765-1766, during the Stamp Act Congress. British colonists in America protesting British rule used the cartoon in the Constitutional Courant to help persuade the colonists. However, the Patriots, who associated the image with eternity, vigilance, and prudence, were not the only ones who saw a new interpretation of the cartoon. The Loyalists saw the cartoon with more biblical traditions, such as those of guile, deceit, and treachery. Franklin himself opposed the use of his cartoon at this time, but instead advocated a moderate political policy; in 1766, he published a new cartoon MAGNA Britannia: her Colonies REDUCED, where he warned against the danger of Britain losing her American colonies by means of the image of a female figure (Britannia) with her limbs cut off. Because of Franklin's initial cartoon, however, the Courant was thought of in England as one of the most radical publications. The difference between the use of Join or Die in 1754 and 1765 is that Franklin had designed it to unite the colonies for 'management of Indian relations' and defense against France, but in 1765 American colonists used it to urge colonial unity against the British. Also during this time the phrase "join, or die" changed to "unite, or die," in some states such as New York and Pennsylvania. Soon after the publication of the cartoon during the Stamp Act Congress, variations were printed in New York, Massachusetts, and a couple of months later it had spread to Virginia and South Carolina. In some states, such as New York and Pennsylvania, the cartoon continued to be published week after week for over a year. 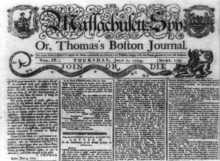 On July 7, 1774 Paul Revere altered the cartoon to fit the masthead of the Massachusetts Spy. The cartoon has been reprinted and redrawn widely throughout American history. Variants of the cartoon have different texts, e.g. "Unite or Dead", and differently labeled segments, depending on the political bodies being appealed to. During the American Revolutionary War, the image became a potent symbol of Colonial unity and resistance to what was seen as British oppression. It returned to service, suitably redrawn, for both sides of the American Civil War. The Latin translation of Join, or Die (Jungite aut Perite) is used as the official motto of the Philadelphia Union soccer team. A snake is also featured in their logo as an allusion to this cartoon. A flag featuring this cartoon was prominently displayed in the opening credits of the TV miniseries John Adams and was the title for the first part of the miniseries. The Late Late Show former host Craig Ferguson has this cartoon tattooed on the inside of his right forearm reaching his wrist, to commemorate becoming an American Citizen. Ferguson also named his comedy-talk show on the History Channel, Join or Die with Craig Ferguson, after the cartoon. The show began airing in February 2016. An image of the Join, or Die snake was delivered as a threat to a victim in the NCIS episode "Dead Air". It was used as a symbol for a Military At Home terrorist group. "Join Or Die" is the name given to the special edition of the video game Assassin's Creed III, which is set during the American Revolutionary War. In the TNT show Falling Skies, when Pope and his gang of outlaws are cornered at gunpoint by Tom Mason, Pope asks Mason for options, to which Mason replies "Join, or Die!". Part of Mason's backstory included him being a Boston University history professor who taught the American Revolution as part of his curriculum. On the Fox show Sleepy Hollow in the episode "Magnum Opus" in Season 2 Episode 10, the original Join or Die cartoon is shown and described as being drawn by Benjamin Franklin to secretly indicate an actual river. Looking at actual map, the place where the mouth of the snake is located is where the main characters find an enchanted sword. The Philadelphia 76ers NBA team integrated the snake into its Liberty Bell logo to create a special edition 2018 playoffs logo, though it used the later alternate version, "Unite or Die." All throughout the game Fallout 4 these posters can be found in buildings with no real context. ^ "Join, or Die". Pennsylvania Gazette. Philadelphia. May 9, 1754. p. 2. Retrieved January 19, 2014 – via Newspapers.com. ^ "Join or Die Snake Historical Flag". Flags Unlimited. Archived from the original on July 26, 2011. Retrieved May 13, 2011. ^ "The Writings of Benjamin Franklin: Philadelphia, 1726 - 1757". historycarper.com. Archived from the original on May 12, 2006. Retrieved May 1, 2006. ^ "Political cartoon: MAGNA Britannia : her Colonies REDUC'D". Library Company of Philadelphia. Retrieved April 29, 2007. ^ "A More Perfect Union: Symbolizing the National Union of States". Library of Congress. Retrieved November 3, 2010. 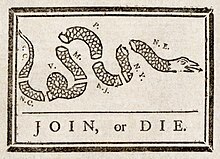 ^ "'Join, or Die' - the Political Cartoon by Benjamin Franklin". BBC. 2003. Retrieved December 13, 2006. ^ "22 September 2009". The View. September 22, 2009. ABC. Retrieved November 3, 2010. ^ "The Rallying Cry of the Robot Skeleton Army". Plixi. February 11, 2010. Archived from the original on July 13, 2012. Retrieved November 3, 2010. ^ "NCIS Recap: Dead Air". CBS. Archived from the original on October 27, 2010. Retrieved November 3, 2010. Olson, Lester C. "Benjamin Franklin's pictorial representations of the British colonies in America: A study in rhetorical iconology." Quarterly Journal of Speech 73.1 (1987): 18-42.